Proudly having drivin PATH Transit buses (fulltime) from 23/09/1996 to 11/05/12. The Adelaide Units have 3 doors. These are the worst buses ever to enter service in Adelaide. Both body work and Chassis are crap. The amount of Engines, Trans and Diff's these buses have had replaced is unreal. The amount on money they cost, you would think we would get more than 14 months out of a diff trans and engine. Lets hope we get something that will last in the next round of buses. ScaniaK320 wrote: The Adelaide Units have 3 doors. Apparently the union in Canberra still thinks that 3 doors is dangerous! Though guess in Canberra 3 doors is overkill for the most part anyway. If you don't like the Scania product how about changing your ATDB name to something else. Would you like to quote some hard facts on drive train equipment replaced and the cost of such.If Scania is such poor product,how come they sell in such numbers to various operators across Australia.Any such issues with chassis or body related issues are covered by long term warranties at no cost to the operator by both Scania Australia and the bodybuilder concerned. Punchbowl Bus and Coach - celebrating over 60 years community commitment through a family owned and operated business and it's heritage of Deluxe,Narwee and GP Bus Companies. As SA is not the only company having issues with this model I think we all get the drift. Long term warranty, I don't call 2 years long term. Scania have come to the party with the Diff issues. P.M.C. producted a much better product when they were in operation and don't tell me they are the same company. As for my name, it has nothing to do with what the current fleet issues with Scania and Custom Coaches or whats left of them. Plus the Scania's in ACT are K360, Adelaide only has 1 x K310 and the rest are L94 or K320. ScaniaK320 have you ever worked with scania? Or on scania engines old and new? Scania are a good make apart from a few minor flaws which all companies experience! The warranty is alot longer then 2 years the company I worked for had 5 years with continuing support from scania after the 5 years. ScaniaK320 wrote: Plus the Scania's in ACT are K360, Adelaide only has 1 x K310 and the rest are L94 or K320. I have been in the industry for 29 years and driven, most makes and models. It is just the Current Scania K320 Unit in Adelaide that I think are the worst buses out. If you board a bus at TTP and head to the city via the O-Bahn Track and sit yourself just behind the centre doors, tell me what you feel while driving along. No other bus does this. I wait for a response about this issue. this is open to everyone. I can not see these units lasting 25 years in Service on the O-Bahn, They are now about 4-5 years old and they are falling apart. It may be the different models K320 and K360. as the K360 are near new at this stage and with a CB80 body fitted. As busrider stated T.S.A. R803/4/5, Light-City Buses 1849 and 1850 are much better buses than you 11xx series. The O-Bahn is a one of a kind system in Australia, When opened in 1986 the buses were Mercedes-Benz 0305-0305G, these buses where not a stock stranded bus due to the requirements of the O-Bahn. But now due to costing the buses are built to a price and not to a SPEC. I don't only blame Scania or Custom Coaches for these issues, the South Australian Government more than 90% at fault for buying low grade units. Scania and Custom Coaches only built what the customer wanted. I Hope you can see what I am trying to say here. I can see what your saying maybe changing bodies for say a trial, would that maybe help there situation I'm not from Adelaide so I will not argue with what your saying I'm just saying scania make good products aswell as bad ones so do all makes, it will be interesting when Adelaide get euro 6 or have they go them? I'm interested to hear the views on them aswell as Canberra's. Sydney has always built a better end product than Adelaide. Why I have no idea? ScaniaK320 wrote: Sydney has always built a better end product than Adelaide. Not so, look at the older J.A. Lawton, Freightliner & PMC buses built in Adelaide, awesome buses that lasted for ages and were very popular when sold off. I think he was referring to Custom Coaches only and not the earlier bus builders. The Adelaide Scanias are being bodied in Sydney.Saw two on the final finish area at Customs Villawood earlier this week. No idea why people think that the K360s are better than K320s or K310s. The chassis on all K-UB/K-UA variants are unchanged, it's just the tune (i.e. power rating) of the engine that's changed! 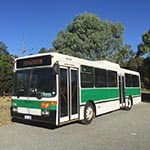 Proud owner of ex-Transperth 1042, ex-Transperth 1114 and ex-STA Adelaide 1549. Nice photos, Inspector. I believe that the ACTION livery looks better on these buses than Redmet (not that I don't like redmet). I read somewhere (probably the SA discussion forum) that Canberra and Adelaide are the only Cities in Australia with Scania K360UA artics- is this true? As I understand, the problem with the Scainas on the O-Bahn is that the 0305/Gs wheels were designed so that all three wheels were always either on a sleeper or not. The new Scanias are not designed that way, which is what gives the uncomfortable ride. As for the engine problems, maybe it was just a bad batch, or maybe there is a problem, I do not know. Lt. Commander Data wrote: I read somewhere (probably the SA discussion forum) that Canberra and Adelaide are the only Cities in Australia with Scania K360UA artics- is this true? Not quite, Metro Tasmania has them too. I don't know why but I think the rear trailer setup on ACTION K360UAs look a bit ugly... particularly the windows. crazyturbo76 wrote: I don't know why but I think the rear trailer setup on ACTION K360UAs look a bit ugly... particularly the windows. It could be the fact that on the CB80 rigid the window line stays the same whereas on the CB80 artics it moves up. Definitely make it uglier, especially so when a CR228L artic (with the window line the same though out the length of the bus) pulls up behind a CB80 artic! The Sydney-built rigids tend to have window-lines that go up after the rear door (i.e. STA K280UBs/B7RLEs and Busways MAN 18.320s), but I presume this can be operator specific as some of Metro Tasmania's CB80s (with the Adelaide-common straight window line) were built at Villawood, and some were built at Adelaide.